I made this the other night for Geoff and it was super easy, delicious and Paleo! I’m not a Paleo devotee (I lack the discipline) but I try to reduce my processed carb load as much as possible. I labeled this a date night dinner, because scallops are more of an adult taste. This dish also makes an impressive plated appetizer. Things to keep in mind when buying scallops. I like to buy frozen scallops because I don’t live right near the coast where I can be sure the scallops are fresh. Costco is my go-to for delicious, consistent scallops. Scallops have different names based on size and how they are harvested. For example Bay scallops are tiny and used in soups and stews while Sea Scallops are large and great for pan searing. Diver scallops are so named because instead of being harvested by chain nets, divers jump in and fetch them. 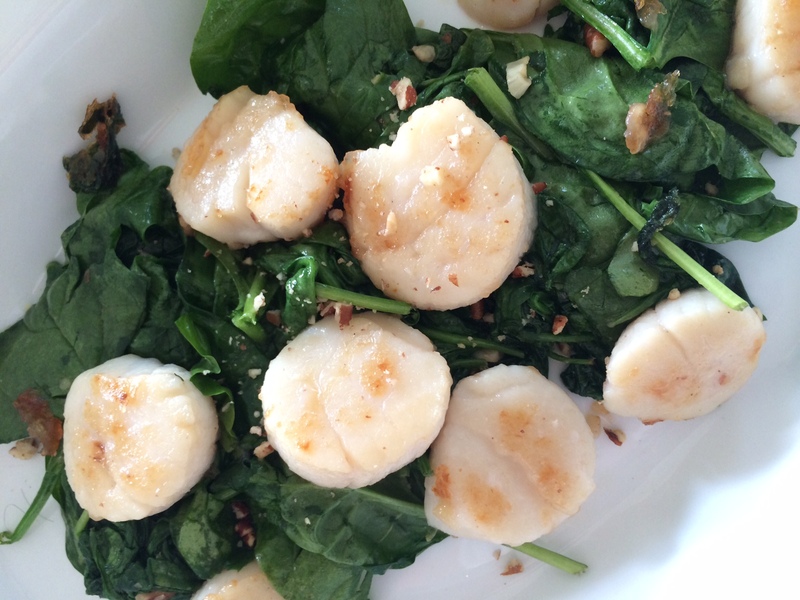 For an extensive, helpful article on purchasing scallops click here. 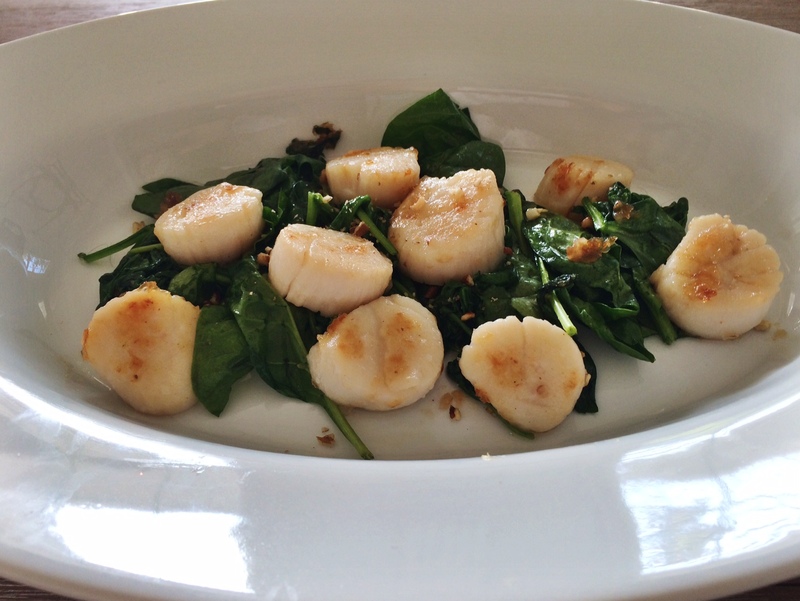 Things to keep in mind when preparing scallops: Make sure you rinse and pat them dry thoroughly. If you don’t, they won’t taste good and they won’t get that delicious caramelized browning when you sear them. 1 tsp Coconut Sugar in the Raw. Yes, according to the Paleo guidelines, small amounts of unprocessed Coconut Sugar is considered Paleo-approved. 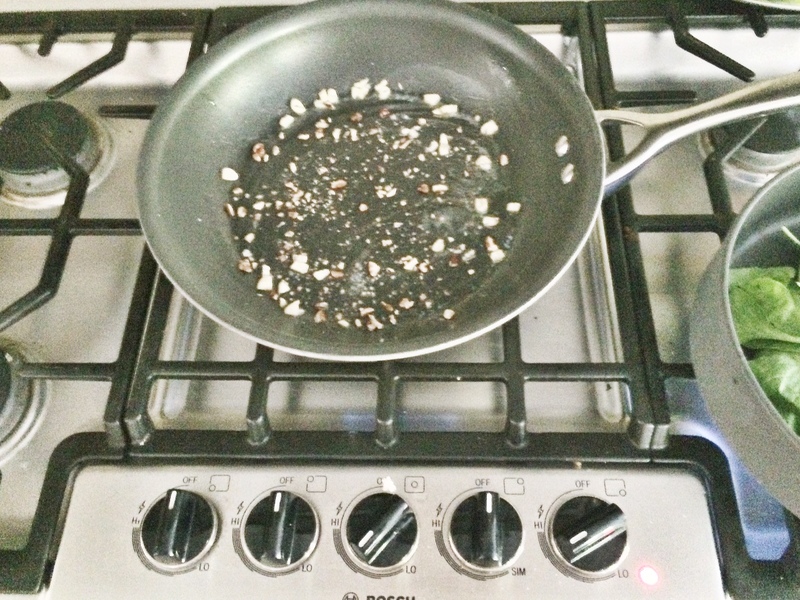 On medium heat saute your garlic in a couple Tbs of Olive Oil. Smelling good up in here! Add 2 Tbs of your pecan pieces to the olive oil and garlic. Add your coconut sugar. Saute for a couple more minutes. Add your thoroughly dried scallops to the olive oil & pecan mixture. It is important not to over cook the scallops! They will taste rubbery if you do. However, I have found that the directions on the Costco bag do not list a long enough saute time. They list five minutes and I would say it’s closer to 10. You will know they are fully cooked when the center is opaque in appearance. Here is my trick to getting that lovely caramelized color on the outside. After your scallops have cooked for about 5 minutes transfer them to a paper towel. 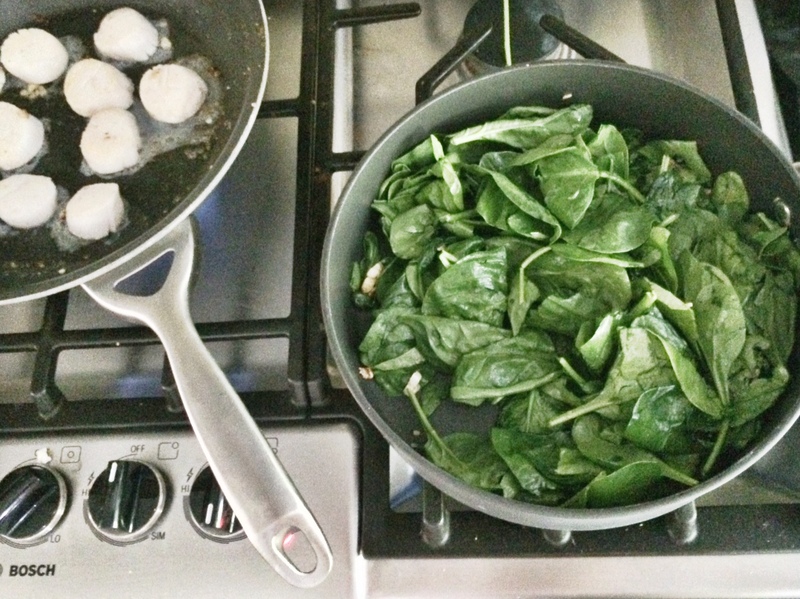 Take the delicious olive oil, pecan and garlic mixture that the scallops have been sauteing in and add it to your spinach. Place the scallops back into their pan and saute for another 4-5 minutes on high heat.